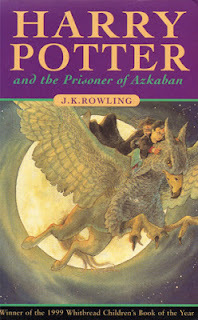 As I read further into the Potter series, I increasingly realise why these books are so popular with all generations. It's not just the underworld of magic, but also the intricacy of the prose. I love how Rowling plants clues and Easter eggs along the way, gently linking a small event in a previous book to a larger one in the present, building plotlines gently. As a reader, it makes me feel very rewarded. The Prisoner of Azkaban also surprised me more than the previous two in the series. Again, it's impossible for me not to continously think about the films, having seen them first. But compared to The Philosopher's Stone and Chamber of Secrets, the on-screen version of Azkaban changes much more. I understand why they had to do this: there are many parts of the book which involve characters waiting for events to occur for prolonged periods of time. And unlike in a written story, a film can't constantly illustrate this kind of time lapse in a way that wouldn't seem mundane. So scenes, especially those nearer the end, had to be cut and altered for cinematic purposes. Anyway, that's another exciting Harry Potter book I can now be happy about having read! Now on to the next four.